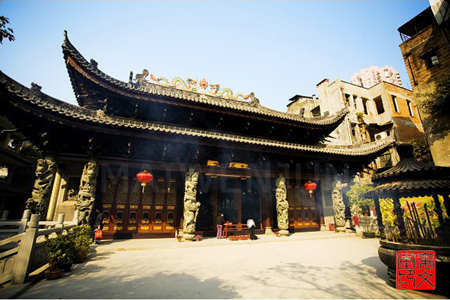 Located on Liurong Road, the temple enjoys a long history of over 1400 years, Liurong temple is one of the most famous historic sites in Guangzhou. 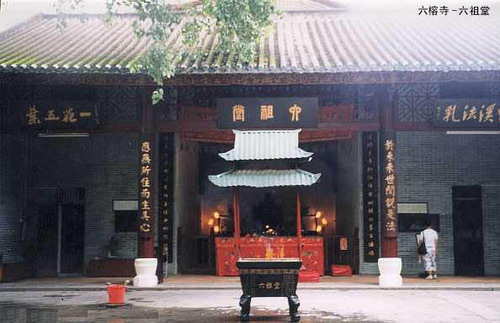 Liurong Temple has the same reputation with Guangxiao Temple. 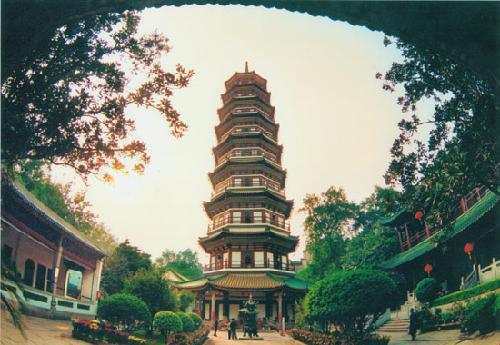 There is an old saying that "Guangxiao is famous for its trees and Liurong is famous for its tower". The temple is well preserved and boasts a very impressive 17 story pagoda, the Hua Ta or Flower Pagoda which is 58 meters (190ft) high. 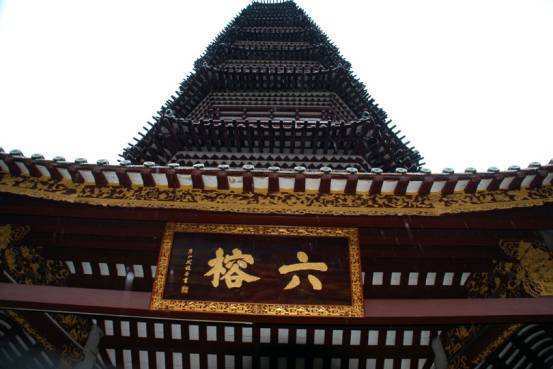 The wooden pagoda was built in the 11th century and features beautiful carvings and balconies. 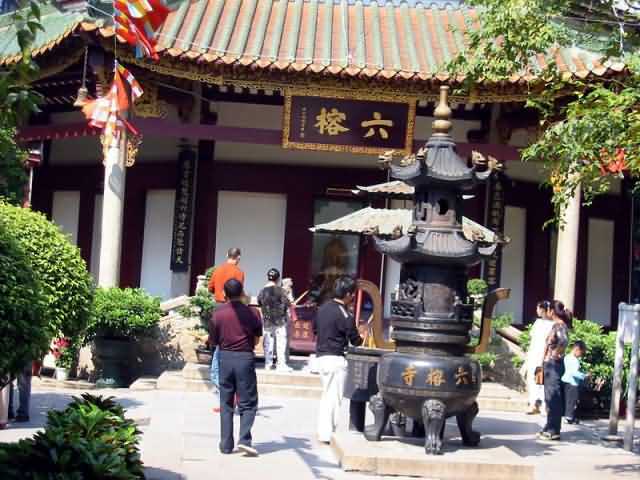 Liurong Temple was built in 537AD and was given its current name by the writer and calligrapher Su Dongpo (1037AD-1101AD) of the Song dynasty. 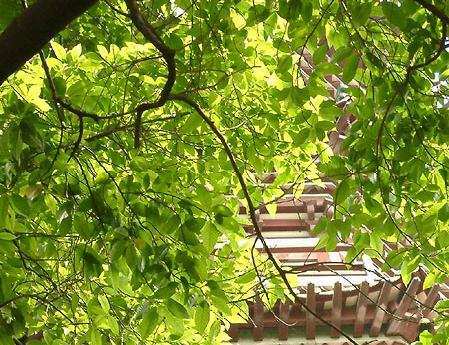 When he visited the temple he so admired the 6 banyan trees in the temple courtyard that he immediately wrote two characters liu rong (6 banyan trees) on stone slabs. These steles can still be seen just inside the temple gates. 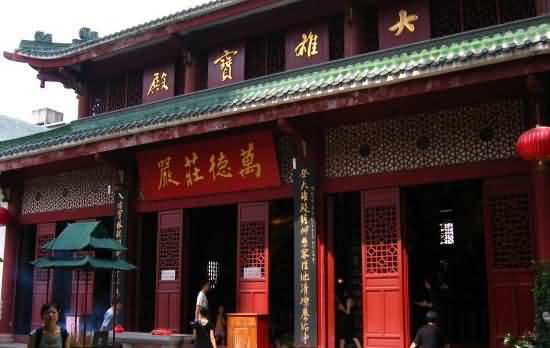 It was renamed as Jinghui Temple when it was rebuilt in 989AD, following the name of Huineng who is the 6th patriarch of Chinese Zen Buddhism. Now the bronze of Huineng is still displayed in the hall. The temple was rebuilt again in 1875AD during the Qin Dynasty. 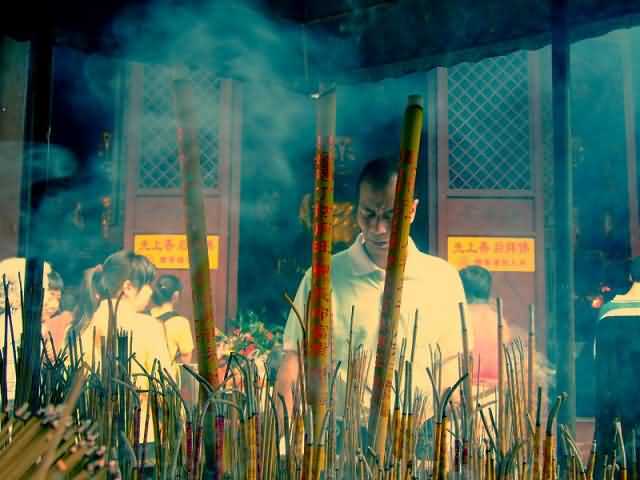 The name Liurong Temple was started from then. Now the pagoda is in 57 meters (187 ft) high with 17 stories. 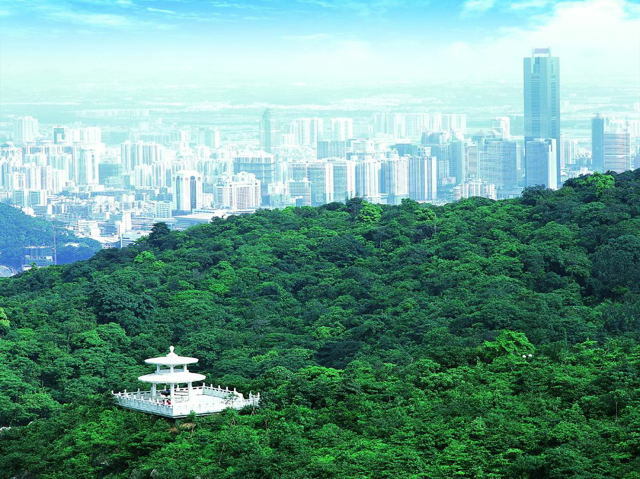 The scenery of the whole city can be viewed when stepping to the top of the pagoda. The figure of Maitreya (eulogy of Buddha) can be found by entering the Heavenly Guardian Hall. (Sanskrit) or Metteyya is a future Buddha of this world in Buddhist eschatology. According to the theory of Buddhism, everything on earth has its process of come into being, development and change. When there is birth, there is death. Buddha is in no excepting in this theory. As the current Sakyamuni Budda's teachings would get to the greatest extent in the end, the Maitreya would fall to the world and moralise the human beings. Therefore it is called Future Buddha. The figure of Maitreya and General Weituo are in great contradiction. Maitreya is affable with smile while General Weituo is portliness. Each of them is in charge of one temple according to the legend. Maitreya is kindness and ardour to the customers while General Weituo is over harshness so as to scare away the customers. 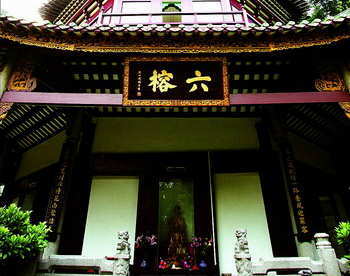 Therefore, the figure of Weituo is displayed oppositely to the Mahavira Hall to take care of the customers' properties. Flower Tower is the dagoba of Liurong Temple. The layer and layer angles and brims like burgundy flower leaves. Together with the flower pistil shaped top, the whole tower just like a flower columniation. The body of the tower is alternated with red and white colour. In the shape of eight-square, the flower tower has 17 stories; 9 outside and 8 hidden stories. With the height of 57 meters (187 ft), the tower has the features of pavilion. 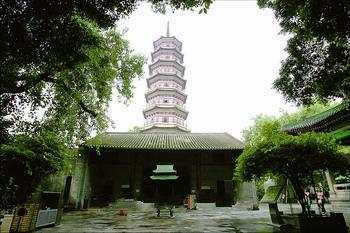 It is the best preserved tower of Song Dynasty(960A.D—1279A.D). The top of the tower is built in 1358. 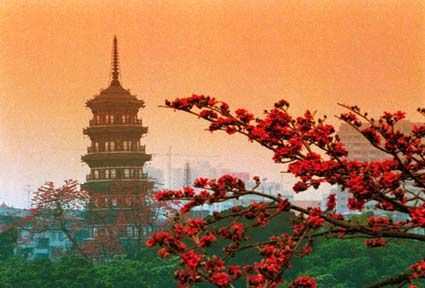 The body of the tower, which is made of copper, has 1023 embossments of Buddha and a welkin pagoda picture on its body. The copper body has a weight of 5 tons together with the components on the top. The scenery of the whole city can be viewed when stepping to the top of the pagoda. The Great Palace was complete in 1984 with the height of 14 meters (46 ft) and an area of 300 ㎡. Its coloured glaze tiles and grandeur appearance represent the traditional features of architectures of South China. Three bronzes are placed in the middle of the palace which are in 6 meters (19.7 ft) high and 10 tons weight. 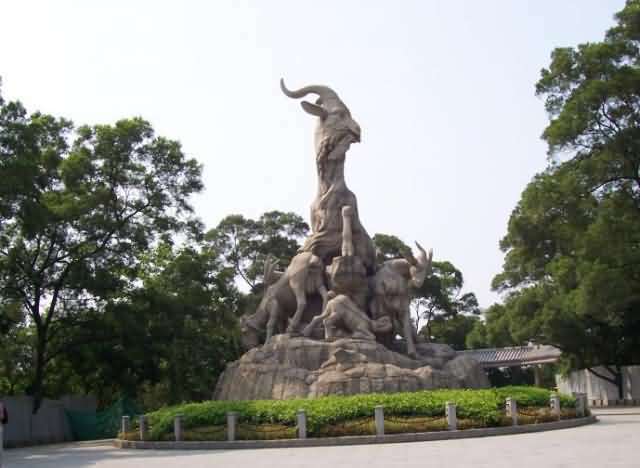 The bronzes are the largest ancient bronzes in Guangdong which were built in the year of 1663. The figure of Sakyamuni is in the middle, Amitabha at the left side and the Medicine Buddha at the right side. 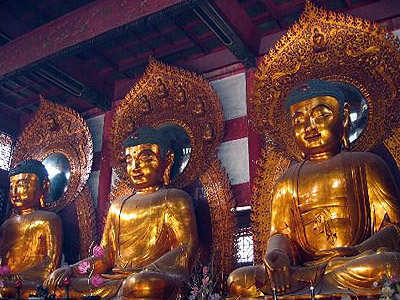 The three Buddha represent the Buddha at present, in the past and in the future. The figure of Sakyamuni, with his left hand palm upwards placing in the middle of his knock-knees and right hand palm downwards drooping on the knee of the right leg, represents the fingerprint of "at present"; Amitabha put his left hand palm upwards in the middle of knock-knees and right hand palm upwards on the knee of the right leg, representing the fingerprint of "in the past"; the Mdicine Buddha put his left and right hands palms overlapped in the middle of knock-knees which means looking on the future. Avalokiteśvara is a bodhisattva who embodies the compassion of all Buddhas. He is one of the more widely revered bodhisattvas in mainstream Mahayana Buddhism. In China and its sphere of cultural influence, Avalokiteśvara is often depicted in a female form known as Guan Yin. The Hall of Avalokiteśvara is in 13 meters (42.6 ft) high with an area of 233㎡. A bronze of Kwan-yin is placed in the middle of the palace with the height of 4 meters (13.12ft) and the weight of 5 tons. The bronze is in extractive craft.